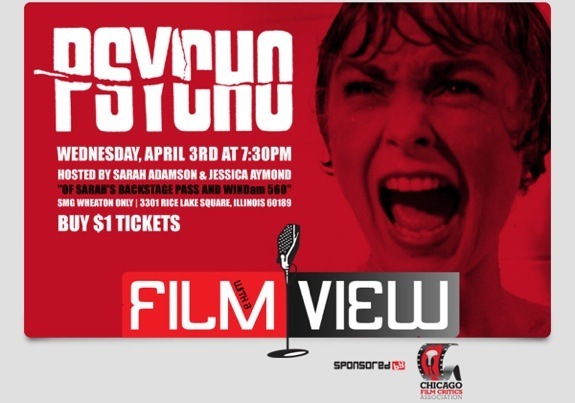 On April 3, 2013 Chicago Film Critics Sarah Adamson and Jessica Aymond hosted the Film With a View series at Studio Movie Grill in Wheaton. The pair presented the original classic, “Psycho” by Alfred Hitchcock and led the post-screening discussion. On the first Wednesday of each month, the Film With a View series features a classic movie screening and discussion with members of the Chicago Film Critics Association. Movie-goers can purchase their tickets and reserve their seats onlinein advance of the screenings. Sarah and Jessica were thrilled to hear that the theater was sold out with 77 pre-sold tickets attracting an audience of over 90 viewers. This 1960 thriller, based on a novel of the same name by Robert Bloch stars Anthony Perkins, Vera Miles, and Janet Leigh. “Psycho” was Hitchcock’s first horror film and the highest grossing of his career. Join the Chicago Film Critics on Wednesday, May 1st at 7:30 pm for the next film in the series, “The Unusual Suspects” a neo-noir crime-thriller starring Steven Baldwin, Gabriel Byrne, Benicio del Toro, Kevin Pollack and Kevin Spacey.